You don’t need a pricey machine to get a delectable cup of coffee. If you haven’t tried making a cup of good old-fashioned pour over coffee at home, you need to get brewing as soon as possible. The biggest benefit of a pour over coffee maker is being able to control exactly how much coffee you make. No more wasting your best coffee beans or pouring out a stale brew. The pour over method lets you make the perfect amount of coffee whenever you need it. Don’t Feel Like Reading? Go with the 8 cup Chemex Classic. It combines style + function and makes enough coffee to share. Click here to check it out on Amazon. 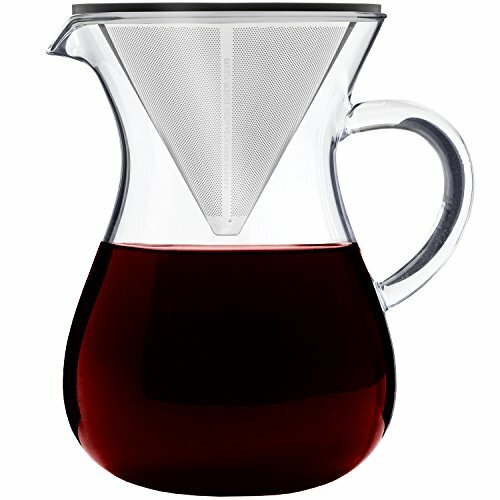 Does Pour Over Coffee Taste Better? It depends on how you like your coffee, but we honestly think how you measure coffee and grind your beans just before you brew has more of an impact. 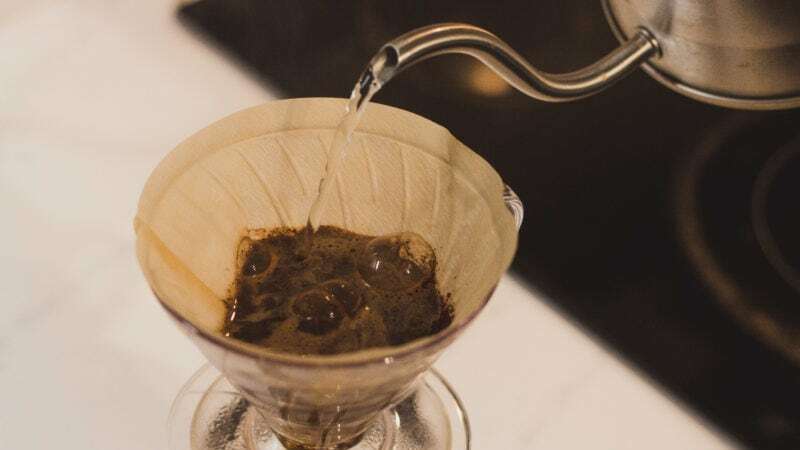 Pour over fanatics insist this method—especially if you skip the paper filter—gives your coffee more natural flavor. That’s because paper filters are so fine that they don’t allow cacao oils into your coffee cup. Whether or not the pour over method makes your brew taste better is up for debate. The best way to figure it out is to try it yourself. What definitely makes your morning better is taking the time to appreciate your brewing process and discovering a new ritual for your morning cup of coffee. Caffeine is associated with frenzied mornings or stressful late nights, so taking the time to slow down and enjoy your coffee might be just what the barista ordered. Dying to try some pour over coffee? (You’re not alone. The cravings are hitting us hard too.) If you’re not quite ready to give up the filter, try a pour over coffee maker that uses one. What comes in five different colors, has a gorgeous flower petal structure, and brews a heavenly cup of joe? Surprise—it’s this pour over coffee maker from Sanyo Sangyo. Made of high-quality Japanese porcelain, it effortlessly combines style and function. The flower petals lining the walls of brewer allow the coffee grounds to expand fully within the filter for better saturation, which means a more robust cup of coffee. 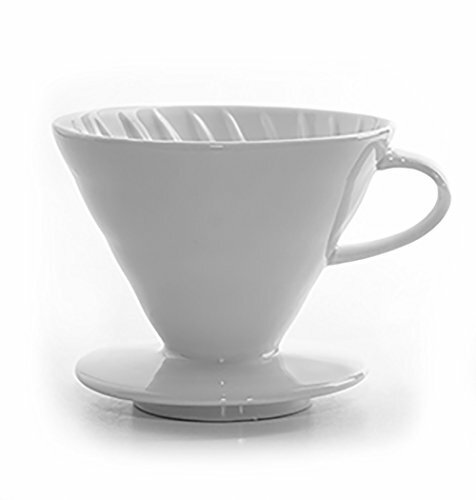 If you’re looking to add a touch of class to your brewing setup, this white ceramic pour over kit from Tanors is the right choice, and a super affordable option. No two ceramics are exactly alike because each one is handmade. The raised grooves inside the funnel help channel the water for an even and consistent brew every time. 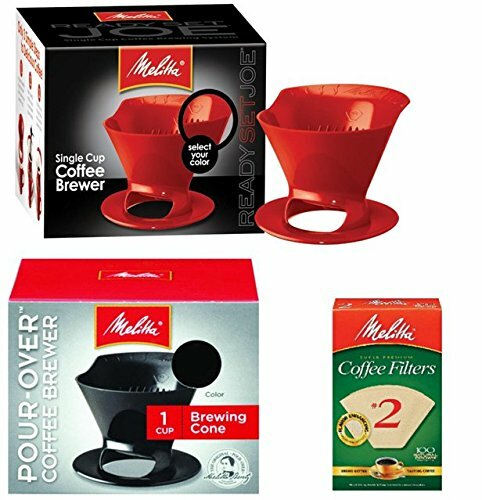 If you’re really looking to brew on a budget, Melitta is the way to go. This single-cup pour over brewer usually runs under $10. It might not be the classiest tool in your kitchen, but it’s easy to clean up and a perfect coffee travel companion. There’s even a space to see the coffee level so you don’t run the risk of overfilling your mug. It also comes with a pack of 100 filters, so it’s a double bargain! Fun fact: Melitta gets its name from Melitta Bentz, the German housewife who invented the paper coffee filter and eventually pour over coffee makers. 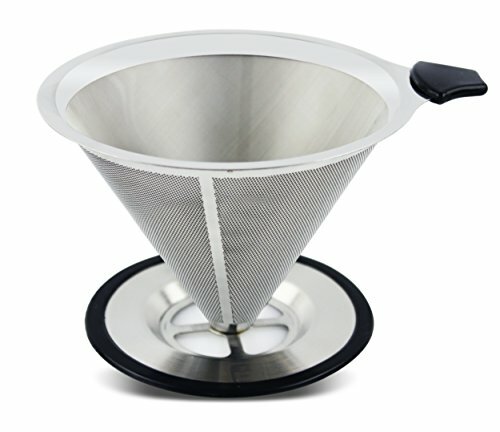 If you’re just not into composting, a filterless pour over coffee maker means less waste and a guilt-free cup of coffee. All our favorites are stainless steel, so you simply have to rinse them before reusing. Made with double-walled, 28-micron stainless steel mesh, you don’t have to worry about coffee grounds getting into your mug. JavaPresse’s coffee maker allows you to enjoy the full flavor of your coffee while skipping sopping wet filters. It was engineered to be shatterproof, so it’s a sturdy option if you want to make a good cup of coffee on the road. The maker from Maranello Caffé combines two filters—a micro mesh inner layer and a laser-cut outer layer—to ensure a clear cup of coffee without a paper filter. Made with stainless steel and a solid metal base, you don’t have to worry about wobbling or breaking. It also has a metal handle at the top to make disposing of your grounds a breeze. 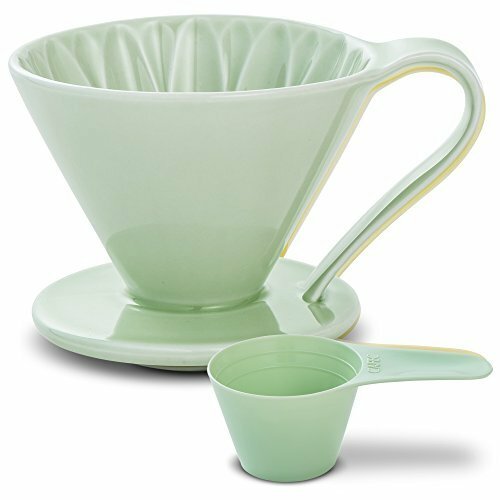 Designed to be cleaned in under a minute, the pour over coffee maker from Meltera is a simple way to start your day. It’s made with stainless steel, ultrafine, dual-layered mesh. The stand also removes for easier and more thorough cleaning. The wide base can fit most coffee cups and travel mugs, plus it has a non-slip silicone ring to prevent spills and scratches. Gooseneck’s coffee maker isn’t just stainless steel—it’s also dishwasher safe. 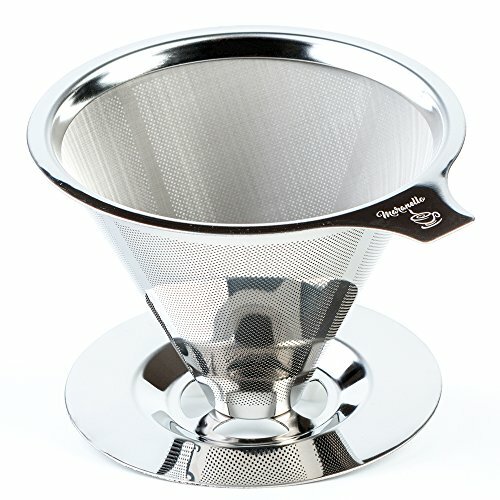 Like the Dolce maker, the ultra fine mesh serves as an eco-friendly, reusable filter. Just empty the grounds, rinse, and reuse when you’re ready for your next cup of delicious coffee. The wide stand can fit most coffee cups or travel mugs and it has a rubber grip to prevent slipping. It also comes with a stainless steel coffee scooper so you can get the perfect amount of coffee every time you brew. Hey, we don’t judge if you can’t live without that fourth cup of coffee. If you find the idea of making one cup at a time absolutely unbearable, don’t worry. These pour over coffee makers can gloriously tackle more than one cup at a time. Maybe you want to feel like a mad coffee scientist when you brew your morning coffee. If that’s your vibe, the Classic Series from Chemex is perfect for you. The glass coffee maker can handle up to eight cups in one brew and includes a polished wood collar and leather tie for extra class. Made of non-porous borosilicate glass, it won’t absorb flavors and is heat-resistant. You can keep your coffee warm by placing the coffee maker directly on a glass stove top or gas flame over low heat. Do not place it directly on an electric coil, though—it can damage or break the carafe. 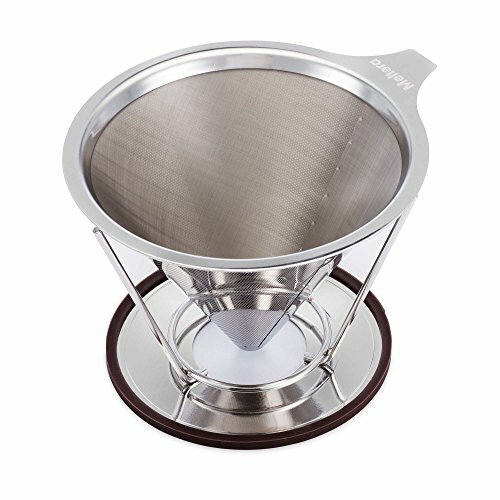 Between a stainless steel permanent filter, glass lid, and heat-resistant collar, the Osaka Senso-Ji has a solution for every potential problem with pour over coffee. The borosilicate glass carafe helps your coffee retain heat without picking up any old flavors, so you get a fresh brew every time. Just remove the filter and serve up to seven cups from the same container. Thanks to the included glass lid, you can stash the leftover coffee in the fridge for later. 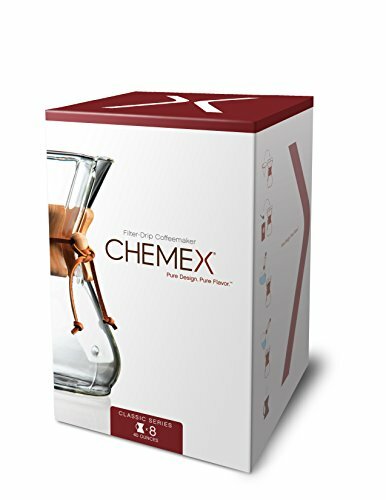 Worried about ordering a glass carafe? Pykal takes the worry away with extra thick borosilicate glass that can withstand direct low heat from stove tops and piping hot coffee. 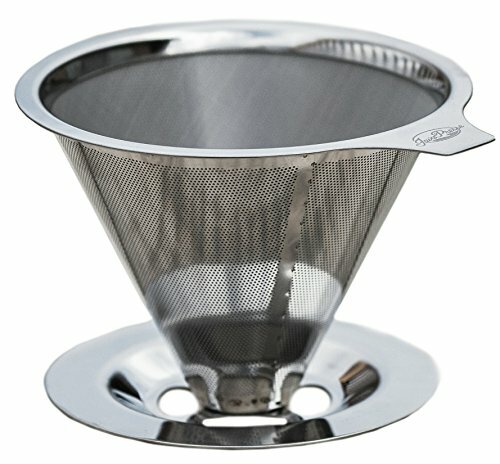 The double layered mesh filter is made of surgical-grade stainless steel for extra rust resistance. 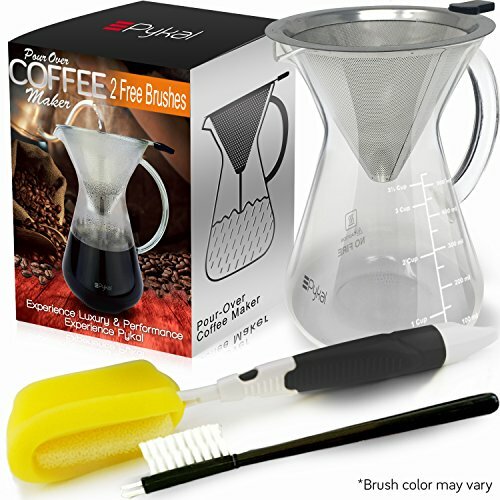 Each kit comes with two brushes to make sure your three-cup carafe and filter are thoroughly cleaned between brews. If you’re looking at Barista Warrior’s carafe and immediately see a lemonade pitcher, you’re not alone. This five-cup pour over coffee maker is a perfect centerpiece for a coffee get-together. 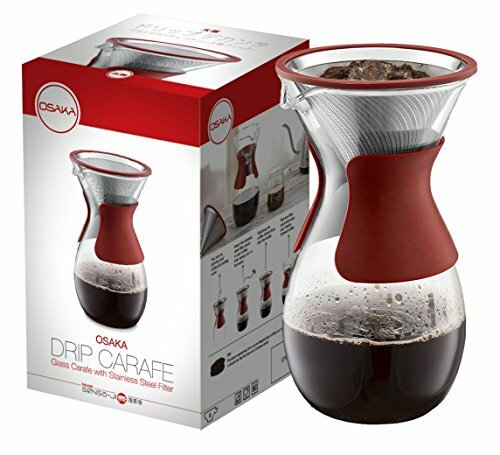 It has a permanent, reusable stainless steel filter with two layers of mesh to ensure a clean brew, plus a wide handle and spout for easy pouring. 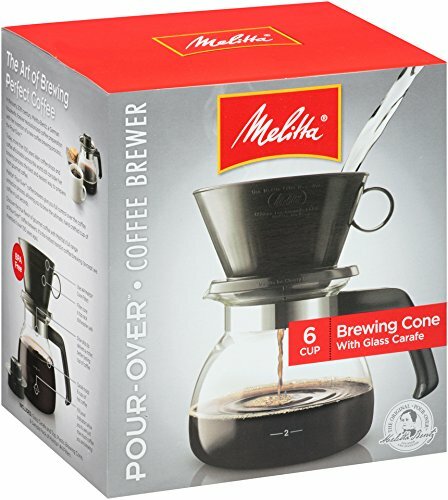 If you’re looking to brew big on a budget, we’re also going to give this one to Melitta. Their six-cup pour over brewer includes a plastic, BPA-free cone with a glass carafe so you can brew for a crowd or your own high-caffeine needs in one shot. The filter cone is dishwasher safe (top rack only), so cleanup is also a cinch. It also comes with a coffee scoop and five filters to get you started. Important: We love coffee just as much as the next connoisseur, but we also care about our health. More than four cups of unfiltered coffee or five cups of filtered coffee a day may have a negative effect on your LDL cholesterol levels. Plus, all that caffeine can make you really jittery. Everything in moderation—even coffee. We hope you find the perfect coffee maker to start your journey into the relaxing world of pour over brewing. You’ll soon discover your inner zen barista thanks to this old-fashioned method, along with a new way to slow down and enjoy your next cup of coffee. Sometimes you just don't have time for a full blown pour over, french press, or siphon brew- we get it. That's why we've put together this complete guide to help you find the best single serve drip coffee maker for your lifestyle.